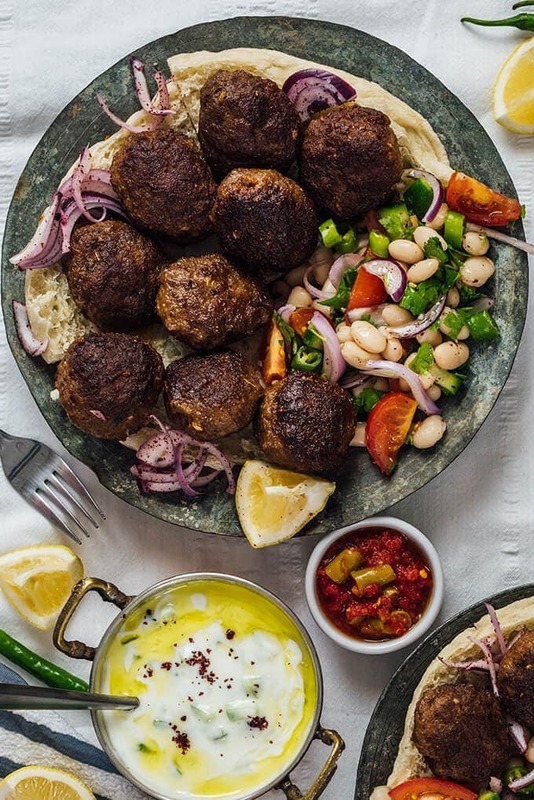 Homemade Turkish Meatballs known as kofte are the best things to happen on your dinner table. These are spicy, tender and perfectly juicy. It’s not a secret any more to make meatballs at home that are much tastier than store-bought ones. I learnt how to make such scrumptious meatballs from a small meatball restaurant (Small ones are always better than the big ones at making meatballs). We often go there and one day I couldn’t wait any longer to ask for the recipe. The chef was so kind that he didn’t make me beg for it. He said “I’ll give my recipe provided that you won’t tell it to other chefs.” You’re not planning to open a meatball restaurant here, do you? Meatballs are probably the best Turkish fast food you can either eat out or make at home. You can find its several varieties in each city around the country. 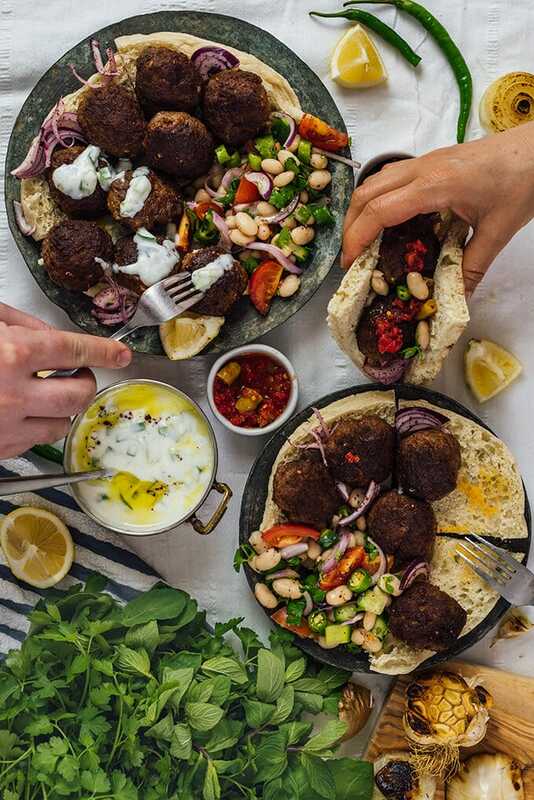 Typical Turkish meatballs are grilled and served with a traditional Turkish white bean salad called piyaz, shepherd’s salad or Bulgur Wheat Pilaf on the side. Yogurt and cucumber dip aka cacik (in Turkish) or tzatziki (in Greek) gives a nice refreshment when served with meatballs. Other sides to serve with meatballs are herbs, pickles, hot tomato sauce, roasted onions, garlic or peppers. 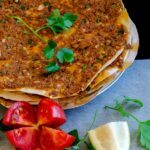 These are accompanied by ayran, which is a cold yogurt drink that goes well with any meat. Moms in Turkey have always meatballs in the freezer and these are their number one option whenever they feel stuck to decide what to cook for dinner. It’s for sure that their family will devour it. They can cook these meatballs in several different ways: Simply fry them, grill on an iron pan, cook in a pot with tomato sauce or with other vegetables or cook in oven. It is simple and easy to make these at home but has some secrets. 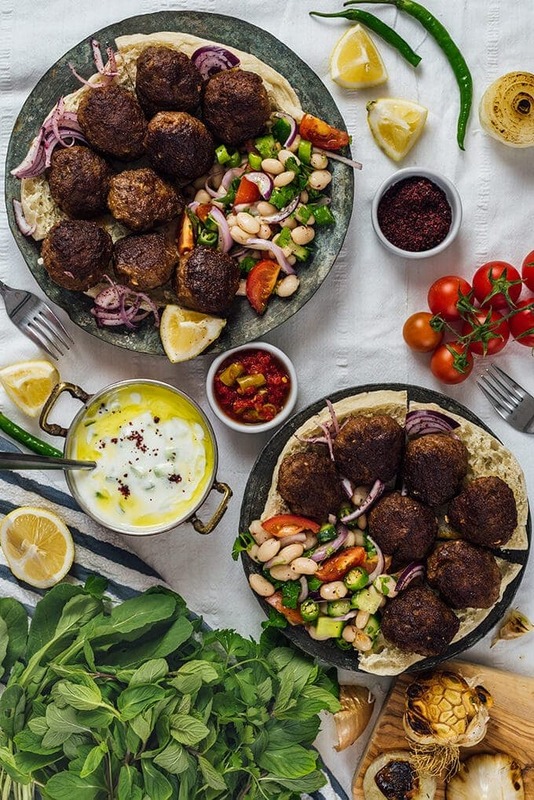 You feel that there is always something missing in your homemade koftes. When you make Turkish meatballs from scratch, you need to know some tips to make them as tasty and juicy as the ones you eat out. What makes Turkish meatballs that tasty is the type of meat used. You need to buy the right ground beef for flavorsome meatballs. Forget about lean ground beef and ask for 20% fat, which means 80% lean. You need fat to keep your meatballs moist on the inside. Another thing when buying ground beef is asking for freshly ground. Don’t buy packaged ground beef, you can never be sure the type of beef inside those packages.Also, it’s not good when it sits for a long time. Finally, have it double ground. The key ingredient for oh-so-good meatballs is baking soda. It helps them have that tenderness. You need to prepare the meatball mixture and let it rest in the refrigerator for 2-3 hours. Overnight is the best. You should dice the onions super finely and remove any excessive juice. If you are at home and don’t have a grill or barbecue, the best way to cook Turkish meatballs is in a cast iron pan. Start cooking them on the highest heat, flipping them over so that all sides equally change the color, for 2 minutes. Then bring it to the lowest heat and continue cooking until done, for about 10 minutes. Form the ground beef mixture into patties. Lay them over a large plate in a single layer. Let them sit in the freezer for 15-20 minutes. Remove from the freezer and put them in freezer bags. They don’t stick to one another this way. You can take the meatballs straight from the freezer and cook. No need for defrosting. You can imagine how time and life saving it is when you have starving people running around you on a busy weekday. You won’t want to buy meatballs from stores anymore once you try this recipe. 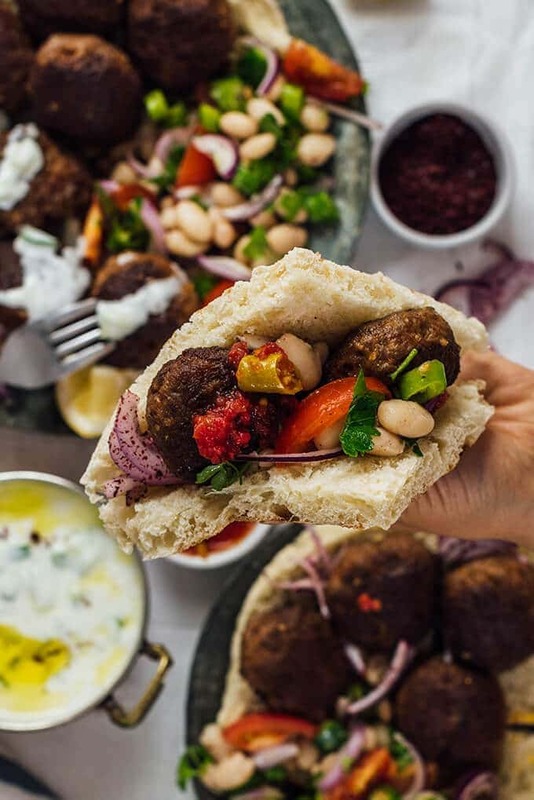 I highly recommend you to make a big batch of these kofte patties and freeze them for busy weeknight dinners. Sometimes I form the patties larger, just as big as burgers and turn my Turkish meatballs into amazing hamburgers. Spicy and juicy Turkish meatballs from scratch. You can use the same recipe to make hamburgers. In a large bowl, combine ground beef, breadcrumbs, finely diced onion and mashed garlic. In a small bowl, mix baking soda, water and lemon juice. Pour this into the ground beef mixture and the spices. Mix well with your hand. Knead it for 10 minutes so that everything is combined well. Cover and let it sit in the refrigerator overnight or at least 2-3 hours. Brush a cast iron pan with little oil and heat it. Cook the meatballs over the higest heat, flipping them over so that all sides are slightly cooked. Bring it to the lowest and continue cooking until done for about 10 minutes, shaking the pan or flipping them over occasionally. Cook the meatballs in batches until they finish or save some to freeze. If you can’t find 80% lean beef, use a mixture of lamb and beef (50% lamb, 50% beef). Prep time includes waiting the meatballs in the refrigerator. The post was originally published in 2009 and has been updated with new pictures. I made the köfte for my boyfriend and myself and I must say it was a hit! It tasted like we were at an authentic Turkish Resturant! The baking soda and lemon will make the meat soft and juicy. Never thought of it’ soo good. Thank u for sharing! Will be a staple in my home. Thank you Amandine for sharing your memory with us. Meatballs are one of the favorites of Turkish moms as no kid refuses these! Great to hear that you liked my recipe! I love kofte however in my opinion It is dreadful making kofte. I don’t like touching raw meat or washing the bowls afterwards, I don’t like shaping them into balls, neither standing for half hour frying them, is there an easier way to cook kofte I don’t know? Maybe you can wear kitchen gloves when making kofte. And if you don’t like frying, you can cook it in oven. I love kofte however I have found out after countless attempts that the butcher always makes better kofte than me so I buy them ready made. Cheating, I know! Your meat balls look yummie!! Me too, I made little balls like that including lemon zest & lemon juice!! I love those tastes in the meat!! These meatballs look delicious! Although it’s not yet warm enough to grill outside, I imagine these will be marvelous made over an open flame! That’s interesting that lemon is used. They look fantastic! I am a meatball lover from way back! These look delicious!! I just love meatballs, I definitely need to try your version. They look so delicious. Since my husband doesn’t like tomato sauce, I always make Swedish meatballs for him but now that I learned about köfte, I will make it for him and I know he will love these! Thanks for a great recipe! Ha, I love kofte, and its very popular in Persia as well, as I learned, the easy way, from my friend. I cannot wait to try your version – you do realize I might be cooking Turkish for the rest of 2009 to keep up with all these wonderful recipes you provide?